Ukrainian Foreign Minister Pavlo Klimkin testifies before a Senate subcommittee on Capitol Hill in Washington, March 7, 2017. Ukraine’s foreign minister applauded decisions announced this week by Canada and the European Union (EU) as important in demonstrating the international community’s solidarity with Ukraine and sending a clear message to Russia. “Look, Russia does not live in a vacuum, sanctions are effective,” Pavlo Klimkin said Friday in an interview with VOA. 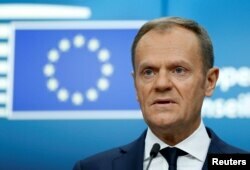 European Council President Donald Tusk addresses a news conference during a European Union leaders summit in Brussels, Belgium, Dec. 15, 2017. The European Union’s sanctions post constraints for Russia’s access to the coveted EU markets. Initially, they were put in place in 2014 “in response to the illegal annexation of Crimea and deliberate destabilization of a neighboring sovereign country.” The EU said all sanctions are kept under “constant review” in order that they continue to contribute toward their stated objectives. Earlier this week, the Canadian government added Ukraine to its Automatic Firearms Country Control List, thus enabling Canadian individuals and companies to apply for permits to export certain prohibited firearms, weapons and devices to Ukraine. “Canada and Canadians will continue to stand with the people of Ukraine and support Ukraine’s territorial integrity and sovereignty,” Canadian Minister of Foreign Affairs Chrystia Freeland declared. FILE - A combination photograph of windows of homes destroyed after shelling in Ukraine's Donbas region during October 2014. Against this background, “there definitely will be more pressure, in the sense of targeted sanctions, in the sense of solidarity” coming from the international community, he said. Ukraine hopes this sense of solidarity will manifest in a United Nations mandate for an international peacekeeping mission in eastern Ukraine, responsible for, in Klimkin’s words, “what is going on and what will be going on in the occupied Donbas,” including a level of security, and free and fair elections. “We will keep pushing Russia to accept that fundamentally, it’s about Russia out, international component in, there’s no other way around it,” Klimkin told VOA’s Ukrainian service. The United States has been a strong critic of Russia’s actions in Ukraine. U.S. Secretary of State Rex Tillerson, left, speaks with his Russian counterpart Sergey Lavrov at the OSCE Foreign Ministers meeting in Vienna, Austria, Dec. 7, 2017. Secretary of State Rex Tillerson voiced the administration’s frustration during his recent trip to Europe. “President (Donald) Trump, as you know, throughout his campaign was very clear that he views it as very important that Russia and the United States have a better relationship, that it is important that countries as powerful as these two nations are should have a more positive relationship,” Tillerson said in Vienna. Natalie Liu has been a staff reporter and writer at Voice of America since 2005. She currently covers the diplomatic beat. Myroslava Gongadze is VOA’s Ukrainian service chief. Natalie Liu has been a staff reporter and writer at VOA since 2005. She currently covers the diplomatic beat.